Nå har du muligheten til å delta på sertifisert Extreme-kurs i NetNordic sine lokaler på Lysaker. 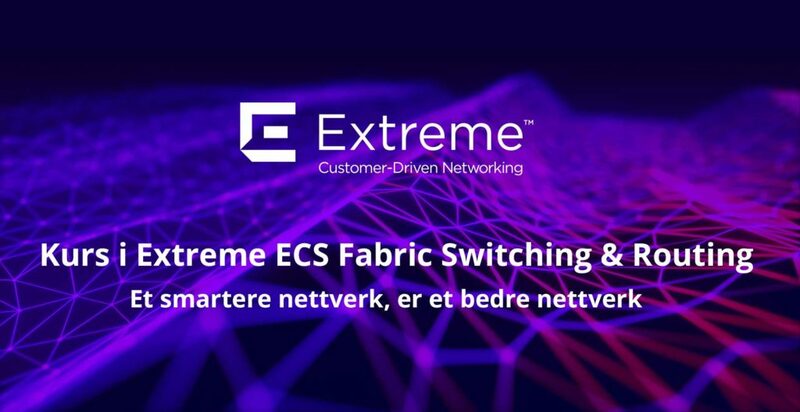 Meld deg på et 4-dagers kurs og bli sertifisert for Extreme ECS Fabric Switching & Routing. Tid: 20.5 – 23.5.19, klokken 9:00. Building and managing networks utilizing the Extreme Networks Campus Fabric networking environment. This knowledge will be reinforced through actual hands-on experience with networking equipment in a lab environment, where students will perform real world tasks. Extreme Fabric Orchestrator, COM Plus, and VPFM Plus. Switch Clustering including Inter-Switch Trunking and Virtual Inter-Switch Trunking.